The Second National Survey on Alcohol and Drugs – BNADS (or LENAD “Segundo Levantamento Nacional de Álcool e Drogas” in portuguese) was conducted by the National Institute of Public Policy for Alcohol and Other Drugs (Instituto Nacional de Políticas Públicas do Álcool e Outras Drogas, INPAD) and The Federal University of Sao Paulo (Universidade Federal de São Paulo, UNIFESP). The study was financed by National Council for Scientific and Technological Development (Conselho Nacional de Desenvolvimento Científico e Tecnológico, CNPq) and by the São Paulo State Research Support Foundation (Fundação de Amparo à Pesquisa do Estado de São Paulo, FAPESP); and carried out by Ipsos Public Affairs. This is a repetitive cross-sectional study. The first stage of the study happened in 2006 and focused on alcohol and tobacco use. The Second Brazilian National Alcohol Survey (BNAS) was conducted between November 2011 and March 2012. 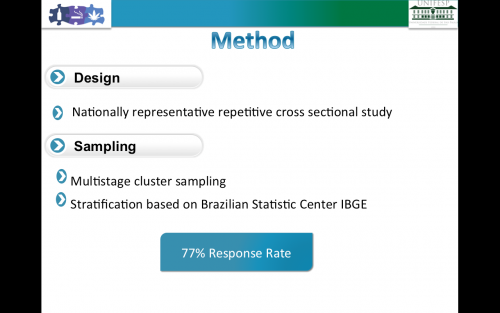 A multistage cluster sampling procedure was used to select 4607 individuals aged 14 years and older including an oversample of 1157 adolescents (14 to 18 years old) from the Brazilian household population and another oversample to represent the State of Sao Paulo. The global response rate was 77% and the adolescents oversample response rate was 79%. The sampling involved 3 stages: 1) selection of 149 counties using probability proportional to size methods (PPS); 2) selection of 2 census sectors for each county, with the exception of the 14 biggest selected counties, totalling 375 census sectors, also using PPS and 3) within each census sector 8 households were selected by simple random sampling, followed by the selection of a household member to be interviewed using the “the closest future birthday” technique. Approximately one-hour face-to-face interviews were conducted in the respondent’s home by trained interviewers using a standardized questionnaire. Based on the HABLAS questionnaire developed by Dr. Raul Caetano. Inclusion of two sessions to evaluate alcohol abuse and dependency based on DSM-IV and AUDIT scale. 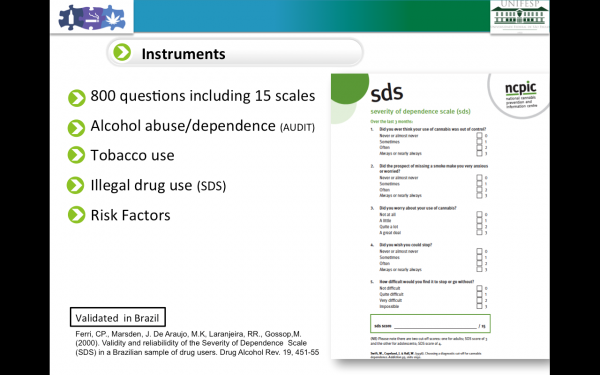 NDSS (nicotine dependence syndrome scale) and TDS (Tobacco Dependence screener) compilation. Translated version of the Adult Psychiatric Morbidity in England����������(NHS Information Centre, 2009). Adapted version of the Conflict Tactics Scale Form R developed by Straus (1998). WHOQOL-bref Scale developed by the WHO and validated in Brazil by the Psychiatric Department of the Federal University of Rio Grande do Sul . Center for Epidemiological Studies Depression Scale (CES-D) validated in Brazil by Batistoni et al (2007). P. Social SupportAdaptation of the Adult Psychiatric Morbidity in England – APMS. R. Pain The pain self-report scale was based on the questionnaire developed by the 10/66 Demetia Group from the Psychiatry Department at the Kings College of London.